"Impotence to see how a beautiful building with so many years of history burns a few meters from you and can not do anything", lamented the Espanyol striker. 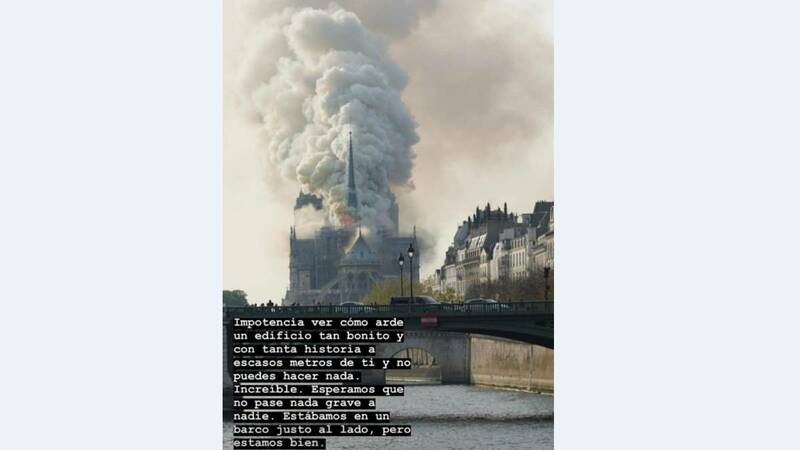 The 'stories' that can be seen in chronological order in the profile of Instagram of Borja Iglesias seem taken from a Hollywood movie but, sadly, they are only a reflection of the cruel reality that this Monday hovered over Paris and, specifically, on the famous Notre Dame Cathedral. Espanyol striker lived the drama from very close. El 'Panda' was in the French capital, along with his partner, taking advantage of the days off that Espanyol had dispensed to the squad after Saturday's victory against Alavés. In the morning, the player published several images and videos of his visit to the Louvre Museum, including a photo next to the universal painting of La Gioconda. He also went to the Eiffel Tower, another inescapable visit. In the afternoon, and shortly after the cathedral fire began, Borja Iglesias manifested himself in a much less playful tone. "Impotence to see how a beautiful building with so many years of history burns a few meters from You can not do anything ... Incredible. We hope that nothing serious happens to anyone, we were on a boat right next to us but we are doing well, "he said, through the social network, and then he posted a couple of photos taken from the very Seine river in which, indeed, the terrifying closeness with the flames and the column of smoke that emerged from the roof of Notre Dame was appreciated, Finally, he wrote other lines: "Thank you very much to all for the messages that come to me asking for our situation, we are well, a hug to all! "This Tuesday afternoon, the player rejoins the training of Espanyol, in Barcelona.